Nina Kowner was born in Lodz in 1935. The daughter of Pola and Ilia Kowner. The younger and only sister of Leon Kowner. She was exterminated by the Nazis in Auschwitz-Birkenau in 1944, when she was nine years old. "My sister Nina was very connected to our father, Ilya. When she was about two or three years old, father who loved animals would tell her stories about his childhood dog named Rozetka. Nina asked to be called by that nickname. Later on dad would tell her stories about his horse from the time he served as a soldier in the Polish cavalry (1919-1920). The name of the horse was Siwka and my sister Nina asked to be called by that nickname. She liked pretending she was a horse and I would put reins on her back and we would run around the dining room table. "Nina had a calm character. We would hardly fight and I supported her. When we moved into the ghetto she was only four years old. It was tragic that we never taught her to read. In the fall of 1942 most of the children were taken for extermination. In the fall of 1942 a curfew (Sperre) was declared in Ghetto Litzmannstadt, with the aim of gathering and sending those who were seen as "unproductive", mainly the elderly and children to the death camps. "After two days of waiting in curfew at home, we were approached by a convoy of S.S men, cops and hundreds of detainees. Some of them walked and those who couldn't walks sat on carts. The convoy moved from building to building and stopped each time. When they approached at our building they screamed at us and shot in the air. The S.S men screamed that they would kill anyone who would hide in the apartments. There were dozens of families who lived in our building. We went down to the yard and we were about a hundred people who stood in formation along the yard. "The S.S moved from apartment to apartment to look for people hiding in the apartments. 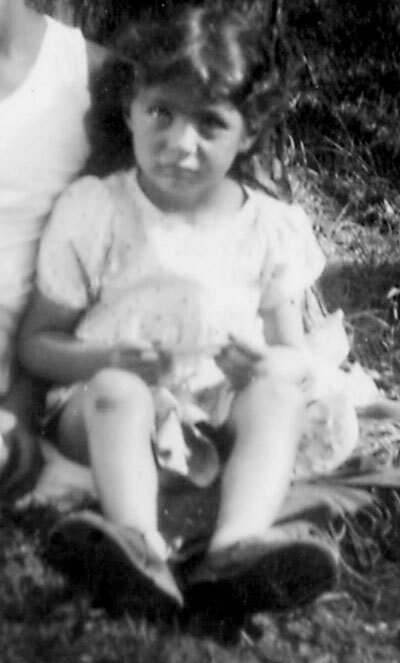 Father wasn't with us at the time and I hid my sister Nina behind my me, when the S.S man took out the young children and the old folks from the line and moved them to the street, where the guards and the other detainees were waiting. Nina understood the meaning of this and she was shivering from fear and I caressed her with my hands behind my back to sooth her. When this selection was over we escaped back to the apartment. "Nina was saved for another two years and she lost all her friends in her age in the area where we lived. Since my parents and I worked many hours every day, Nina stayed at home many hours every day and she was very lonely. "At the end of August 1944 Ghetto Litzmannstadt was being evacuated and we were among the 70,000 people who were sent by trains to Auschwitz-Birkenau. We were a few thousand people in that freight train and that included my parents, my sister and me. The train arrived inside the Auschwitz-Birkenau camp. At first they a separated between the men and the women. My father and I, we passed the selection and stayed within the temporary living. "A year later I met a friend who survived the war and she told me that the S.S. doctor took out her mother and Nina and ordered them to the death side and herself and my mother to the living side. Nina yelled and our mother, Pola, jumped to the death side. That was the last day in the life of my sister Nina and my mother Pola Kowner."